The organizers of the upcoming Christ at the Checkpoint conference joyfully announced on Monday the addition of Palestinian Authority Prime Minister Rami Hamdallah to their list of speakers. "We are glad to confirm that his Excellency the Palestinian Prime Minister Dr. Rami Hamdallah will attend and speak in the opening session of the conference," the organizers posted to their Facebook page. Both Hamdallah's invitation to address the event and the organizers' happy acknowledgement of his acceptance speak volumes about the true underlying message of Christ at the Checkpoint. This development also bolsters the arguments of those Messianic Israelis who feel they cannot endorse the conference with their own attendance. So, who is Rami Hamdallah that his presence at Christ at the Checkpoint should cause such a stir? 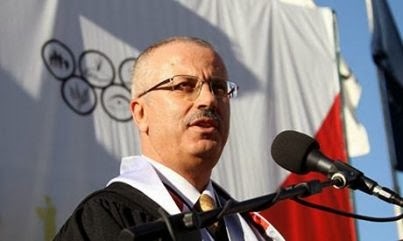 Prior to being appointed prime minister of the Palestinian Authority last year, Hamdallah in 1998 accepted the post of president of An-Najah University in Nablus. Just three years into the job, Hamdallah oversaw a spectacularly grotesque celebration of anti-Jewish terrorism. As part of the Hamas-sponsored "Splendors of Terror" exhibition put on at An-Najah University in September 2001, students reconstructed and reenacted the gory suicide bombing of the Sbarro pizzeria in downtown Jerusalem six weeks prior. Fifteen civilians, including seven children and a pregnant woman, were killed and another 130 were wounded in that attack, which under Hamdallah's tutelage was commemorated as a heroic act of "Palestinian resistance" (see video). Since that time, various think tanks have labeled An-Najah as a hotbed of terrorist recruitment and activity, and Hamas described the institution as a "greenhouse for martyrs." That is the legacy of Dr. Rami Hamdallah.